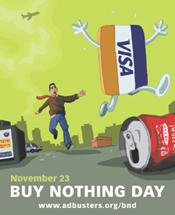 Buy Nothing Day Is Friday - Are You Participating? This Friday, known as “Black Friday”, is normally the day when every retailer on the face of the planet puts some crap that none of us really need on sale…just to get us to buy some of it. People actually get up at the crack of dawn to go shopping – something I have never understood and never will. While I can understand some parents feel the need to get THE toy this holiday season, most of the stuff that retailers put on sale are things that are just newer versions of items you already own and do not need to replace. If your television already works, why buy a new one just because it is on sale? Anyway, the alternative to this mass consumerism day is “Buy Nothing Day“, which my wife and I have taken part in for a few years by purposely not buying anything. Sure, we still have to pick up a few presents for our families before Christmas, but we certainly don’t need to go out on Black Friday to get them. Besides, we do a lot (most, actually) of our shopping at Amazon.com (like Punny Money), which provides us a tax-free and shipping-charge free experience. While we spend the rest of the year trying to consume less and less, participating in Buy Nothing Day each year reminds us to keep up that effort through the holidays, when the drive to consume can be rather strong. I’m definitely going to be participating in Buy Nothing Day. I’ve always loathed the whole idea behind Black Friday. Just because you can save a few hundred dollars on that 50″ plasma HDTV, that still doesn’t mean that you can actually afford it, let alone actually need it. This Friday, the only place you’re going to find me is at home with the family – sleeping in late and eating Thanksgiving leftovers. Absolutely. Well… I will have to buy gas and a soda on a road trip, but if I were home, I wouldn’t be going to the stores for shopping. I’m going to do as much as I can on-line this year. I’ll be a nasty consumer on friday. But not at the Black Friday sales. I’ve got a project I’m working on in the yard, and I need some supplies. Friday is really the first time I can make it to the hardware store, so I’ll be buying some things then. The reason I’m doing it friday is b/c I’m actually off of work and have time, and has nothing to do with “black friday”. Thanks for the comments – glad I am not the only one that sees how silly Black Friday is! Absolutely! I had enough of the holiday commercialism (and commercialism in general!) and so I no longer participate. At all. I generally buy a few things for my mother and some winter clothing I need in October and early November, and then I do not buy anything but food or gasoline until after the new year. When I do shop, I look for local and/or green products. I live in the USA and so I try to buy as much as I can that is made in the USA (even if I have to pay a bit more) or buy things second-hand. Rather than spending time at the mall on Black Friday, I will be spending quality time with my kids (both have tails), doing some housework, and reading a book! That’s great Shela – that’s what the day should be about, spending time with family. We all get so few days off during the year that using one to shop is quite strange. Enjoy your holiday!